1. In a pan, heat oil. Add ginger-garlic paste and fry till raw smell goes. 2. Now, add onion, green chillies and tomatoes. Fry well, till onion turns brown. 3. Meanwhile, pressure cook all the other vegetable. Mash them and Keep aside. 4. To the onion & tomato, add salt, jeera powder, coriander powder, Chilly powder, Pav Bhaji masala and turmeric powder. Mix well. 5. Now, add the mashed vegetables. Simmer the stove and allow the contents to cook for about 20 minutes. Add lemon juice. 7. Slit open the buns, apply butter. Toast the buns over a skillet till golden brown. 8. Serve hot with bhaji, onion and lemon pieces. 1. Dry roast all the ingredients except redchilly powder and turmeric powder. 2. Blend to a fine powder. 3. Mix the powders and store it in air tight container. Pav bhaji looks very tempting dear. Thanks for the masala recipe too. Such a tempting pav bhaji dear Nithu..makes me hungry..very prefect entry..
pav bhaji looks really good. thanks for the masala recipe i will try later. Looks very tempting. It is everybody's fav at home. Nice entry. It is my favorite.LOoks really tempting!!! wow yummy and delicious pav bhaji..
Yum! This looks really good. It sounds like a flavorful veggie dish, I really love this semi homemade idea. Way to go, Nithu! Looks gr8.. its my all time fav.. nice presentation! paav bhaji and the pav and the presentation all looks perfect, want to grab that plate right now!!! this is my all time favorite...looks so yummy! this is my fav. chaat. looks yummy. this is my favorite...yummy, delicious and colorful !! Wow... I am so very tempted!!! Love Pav Bhaji's.. Urs look just awesome! Wow.... its my favorite, looks very tempting and delicious. 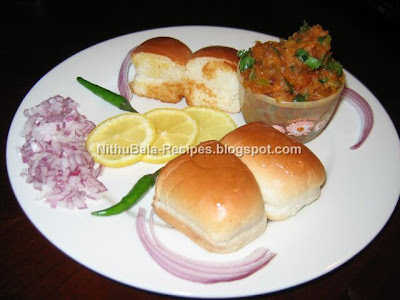 Pav bhaji looks yummylicious n amazing click nithu.You have got a lovely blog.Following you. My all time favorite Pav Bhaji!! looks delicious! thanks for sharing masala recipe also..will definitely give it a try!